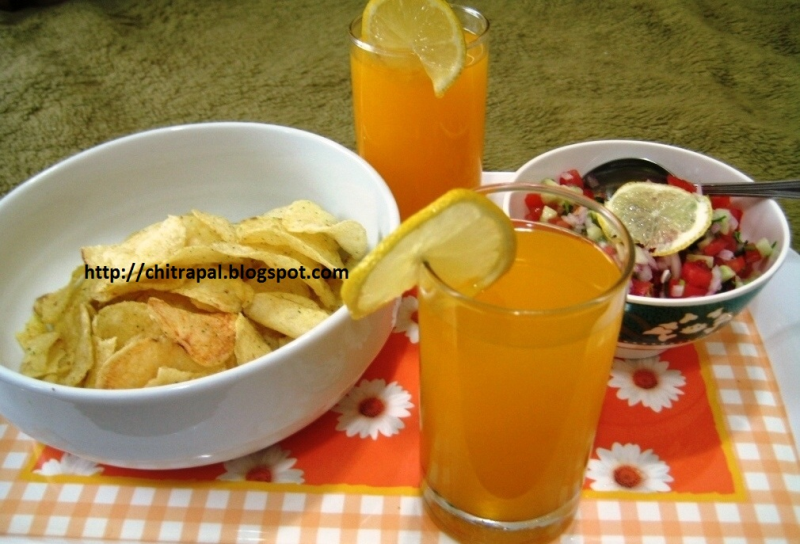 Now you can enjoy the game with these quick combination of drink and snack. Invite your friends over and enjoy your favorite team win. Its quick and healthy snack. Just make it before hand. Mix orange juice, pineapple and lemon drink and stir, keep it in fridge to chill. Use ice cubes if required. In a bowl add tomatoes, cucumber, onions, cilantro and mint leaves. Toss it well. Now add Salt and black pepper to taste and add lemon juice. Serve the salsa in a serving bowl with one lemon slice garnish with bag of baked chips in a bowl. Pour in the drink in two serving glasses with lemon slices. Put together everything in a serving tray with baked chips and enjoy your evening snack in hot summers or enjoying your favorite game.